Kindness week March 25th – 29th! We will be launching Kindness week March 25th – 29th! 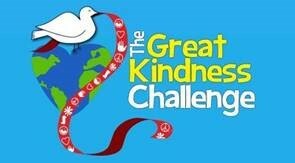 We are putting our own spin on the nationally recognized Great Kindness Challenge (see more information here). Kindness week fosters a culture of kindness, and provides opportunities for kids to show kindness to others. Each student will receive a Kindness Challenge checklist with acts of kindness to complete throughout the week. There will be a raffle at the end of the week for those who complete 30 acts of kindness (10 for kindergarten). Students will also build a kindness tree in the lunchroom by turning in acts of kindness that they witness others doing. We will read some of these acts of kindness daily in the lunchroom. Each day will have a different theme and activity schedule in the lunchroom! Please remind your student of the daily theme. Monday 3/25 – Launch Day! Each student will receive a kindness bracelet to wear throughout the week - Thank you PTA! Lunchroom: Mix it up Lunch! Kids will be encouraged to sit next to someone new. Kindness Week Ideas at Home! o Complete your own acts of kindness at home! Visit the website to download the Kindness Challenge Checklist - Family Edition. o Watch movies that raise kind kids - with lessons about kindness, empathy, and friendship, these do more than entertain - Find movies. Please reach out to our School Counselor, Celina Schulenberg, Schulenbergc@issaquah.wednet.edu with questions!